On October 21, at the Prefectural Budokan in Naha City Kenji Yamauchi, the creative director Fashion House Madonna, shows a denim jacket made of fabric into which weathered coral powder has been kneaded. The 35th Annual Okinawa Industrial Festival opened on October 21 at the Okinawa Prefectural Budokan in Naha. The booths at the venue featured many typical and attractive Okinawan products, including new items with high-tech and innovative features. Cosmetics and kariyushi apparel designed to match the tastes of women and young people attracted the attention of visitors. In the business meetings held during the festival, local manufacturers worked hard to sell their products to buyers from Asian countries. The unprecedented number of exhibitors participating in the festival reflects the fact that a diverse range of individuals and groups are working on a variety of manufacturing projects in Okinawa. Fashion House Madonna (President Mitsuko Yamauchi), which is working on the production of clothes using materials such as Okinawan weaved fabric and dyeing methods including bingata, exhibited jeans and T-shirts made of rayon fabric into which weathered coral powder has been kneaded. These products called “sea silk” have superior qualities in terms of warmth and elimination of odor, and also cut out ultraviolet rays. It took about 18 months to develop the product through a process of trial-and-error. Currently, the company produces three items of jeans for men, one type of women’s jeans and is also developing some denim jackets. 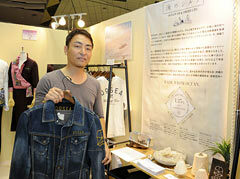 The jeans sell for 25000 yen under the brand name “DoSEA” in three shops in Naha, including Okinawa Mitsukoshi. The sale of T-shirts will commence from this November and the denim fabric has been adopted for use by an established French luxury brand. Kenji Yamauchi, the company’s creative director said, “These products are to be adopted by a spring-summer collection due to be unfurled in Paris. We would like to encourage the use of a fabric like this that utilizes the resources of Okinawa.” The company will use “sea silk” fabric in underwear and daily items in the future.